World War II – every day's a holiday! When I first visited Dresden in the mid-1990’s, to my eyes it looked like the city had just stepped out of World War II, even though, in retrospect, it must have undergone a great deal of renovation by that time. Dresden miraculously survived the first five years of World War II intact, having dodged the Allied bombings that destroyed much of Berlin, Hamburg, and other German cities. 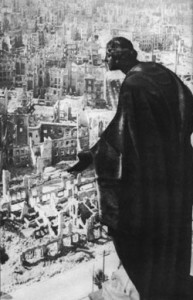 Many Germans felt that the city had developed a de facto immunity, perhaps because of Dresden’s cultural significance, the beauty of its historic buildings, churches, and neighborhoods, and its diminished value as a military target. “[W]ith a small ration of red wine, we brewed a hot punch and talked about where we would go should the Russians overrun us. But the Americans were also not too far away, and we only hoped they would come first. The Americans did come first, but hardly in the way the residents of Dresden could have imagined. When the air-raid sirens began that night at ten minutes to nine, Erika and her family headed down to the cellar. 25 minutes later, approximately 250 British and U.S. planes unleashed over 800 tons of explosives and incendiaries. The largest bombs weighed two tons and were called “block-busters” because of their capacity to take out a city block. When Dresden residents came out of the basements to see their city in flames, they thought the worst was over. They were wrong. Around 1:20 am, just as crews were trying to put out the flames, a second wave of over 500 bombers arrived, dropping 1,800 more tons of explosives on the city. Because the first bombs had destroyed the city’s air-raid siren system, most received no warning of the attack. By the morning of February 14 the entire center of the city was engulfed in a firestorm. Waves of bombers continued. Just when survivors would think the bombings had ceased, they would begin again. The temperature in the center of the city reached 1600 degrees Fahrenheit. Thousands of families who sought shelter in their cellars suffocated to death as the oxygen was sucked up by the massive fires. Kurt Vonnegut was an American POW in Dresden during the attack. His experiences there inspired the novel Slaughterhouse V in which the main character, Billy Pilgrim, is part of a squad of prisoners whose job is to remove countless corpses from destroyed buildings and shelters. Now however, Germans young and old gather in Dresden on the evening of February 13 and remember the lives lost here, known and unknown. I was in Germany in March 2003, with a friend from East Germany, and learned Dresden was again a cultural landmark, “Paris of Germany” they called it, rebuilt like a Phoenix, except for the Dresden Church that remains as a reminder of the bombing. That evening we turned on the TV see another city on fire. U.S. planes had just begun bombing the city of Baghdad. 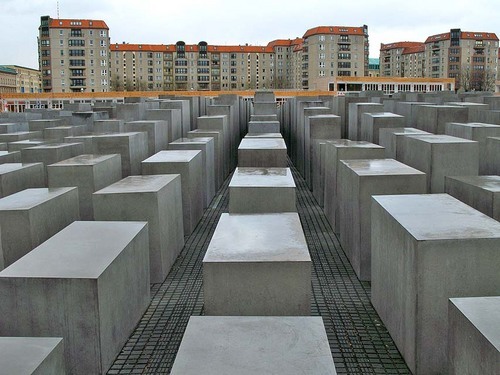 Today the UK and Germany remember the Holocaust of World War II when 6 million Jews were killed in concentration camps across Europe, along with untold numbers of Roma, communists, homosexuals, the mentally and physically handicapped, and political prisoners. January 27th marks the anniversary of the liberation of the Auschwitz-Birkenau concentration camp. It is estimated that as many Jews were slaughtered at this one camp than remain on the entire European Continent today. To this day the Jewish population has never reached its pre-1939 numbers. It’s easy to be tolerant in times of prosperity. In better times Hitler may not have appealed to the Germans. But in times of scarce resources the search for a scapegoat as a possible way out was too appealing. The illusion Hitler sold was that Jews were responsible for the recession. The reality was that the seizure of Jewish assets and property meant “free money” for the rest of the nation. It was an offer too good for the Germans to pass up, even if it meant the “dehumanizing” of a minority. Could it happen in America? It would take a major catastrophe. In the days after 9/11, though not widely reported in American media, hate crimes were committed against Muslims for no reason other than their religion. A Sikh man in Arizona was killed simply because he looked Muslim. The nation waited for the speech in which the President made it clear to the public that Muslims in America are Americans, entitled to the same rights of life, liberty and the pursuit of happiness. And that violence against anyone based on their religion is contrary to the American way of life. The speech never came. In the crusade against evil, preventing hate crime was not on the top of the agenda. Former Indonesian President Suharto, the genocidal architect responsible for the killing of 183,000 East Timorese, a quarter of East Timor’s population, died earlier today . His obituary reads: Suharto Leaves Legacy of Stability in Region. In some places ethnic cleansing still falls under stability. And “Never Again” is an ongoing struggle. The above line was supposedly uttered by Adolf Hitler to his chief of staff Alfred Jodl, referring to his order to General Dietrich von Choltitz, military governor of Paris during the German occupation, not to let majestic city of Paris fall back into Allied hands, except as complete rubble. In August 1944, General Eisenhower originally refused to divert troops to help the liberate Paris on the Allies’ way to Berlin; however, Charles de Gaulle threatened to take his own Free French forces anyway, alone if need be. As Free French forces neared, the Parisians launched a massive strike and mobilized for an all-out war with the German occupying forces. 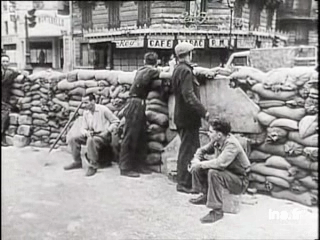 The French Resistance and Free French battled the German occupying force for nearly a week in late August 1944, until Choltitz surrendered on August 25, 1944. Choltitz is one of the most controversial figures of the Vichy France. He is seen as a hero to some for refusing to obey HItler’s orders to destroy one of the greatest cities in the world. However, in addition to having served Hitler and the Nazis faithfully during the war, he ordered the executions of numerous French Resistance fighters and destroyed Paris’s Grand Palais in the final days before the Liberation. His motivations may never be fully known, but fortunately for us, centuries-old Parisian landmarks survived the war and the battle for liberation with minimal physical damage. We, who have lived the greatest hours of our History, we have nothing else to wish than to show ourselves, up to the end, worthy of France. Liberation Day is not a national holiday in France. 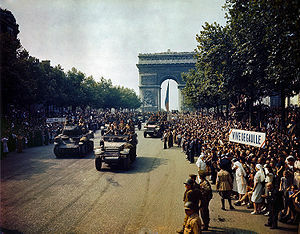 Rather, the French celebrate Victory Day 1945 on May 8, the anniversary of the official end of hostilities in Europe the day after the surrender of German forces in Rheims, France. 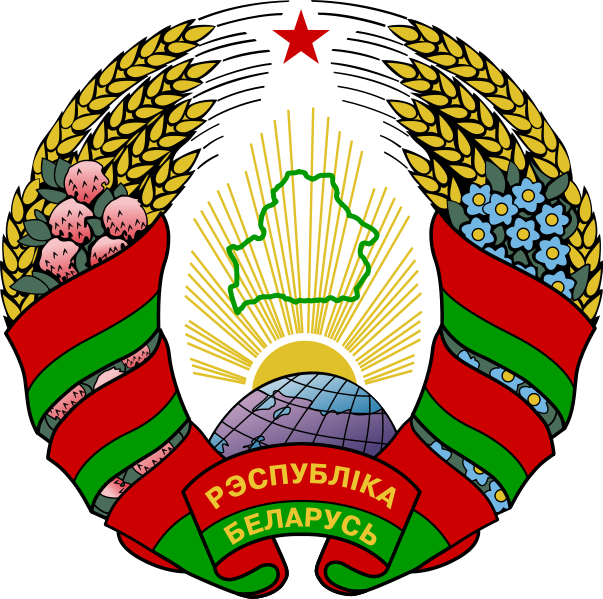 Belarus as we know it today declared its independence from the Soviet Union on July 27, 1990, and became the Republic of Belarus the following year. But the country celebrates Independence Day on July 3, in memory of the liberation of its capital city Minsk from Nazi forces in 1944. We know all about D-Day on June 6th and the liberation of Paris on August 25th that year, but at that same time, the Soviet Union was conducting an equally pivotal advance against German forces. In just over a week, the Red Army crossed the Berezina River. Three days later, on July 3, 1944, they liberated the Belorussian capitol of Minsk. Every fourth citizen of Belarus was killed in the war. Belarus declared its independence from Russia on March 25, 1918 (an independence which lasted about 10 months) and again from the Soviet Union on July 27, 1990. But Belarus celebrates neither of those dates as its official independence day. Instead, the festivities of July 3rd commemorate the liberation of Belarus’s capital city of Minsk from Nazi forces in 1944. We know all about D-Day on June 6th, 1944 and the liberation of Paris that summer, but simultaneously the Soviet Union’s Red Army conducted an equally pivotal advance against German forces. The Belorussian Strategic Offensive Operation (Operation Bagration, named for a 19th century Georgian general) was “the most calamitous defeat of all the German armed forces in World War II” according to Bagration 1944 author Steven Zaloga. 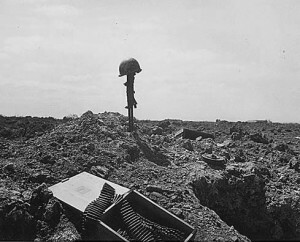 The division among Belorussians referred to in the opening quote stems from the notion that World War II was merely one occupation replaced by another. Prior to the Nazi invasion in 1941, the Soviet Union under Joseph Stalin conducted mass executions in Belarus—the mass graves from which were uncovered in the 1980s. In 1986 the Chernobyl Disaster and the Soviet Union’s initial denial of the nuclear accident fueled the flame of nationalism and independence once more. June 6 marks the anniversary of the 1944 Allied invasion of Normandy that precipitated the long and brutal campaign to liberate Western Europe from Nazi power. 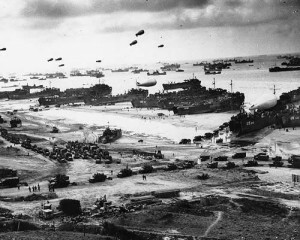 The invasion, also known as Operation Overlord, involved the landing of approximately 160,000 Allied troops, including U.S., U.K, Free French, Canadian, and Australian forces, in a single day along the heavily fortified Normandy coast. The day was scheduled to be June 5, but unfavorable weather conditions forced the landing back a day. Contrary to popular belief, D-Day doesn’t stand for Debarkation Day. Operation Overlord referred to the entire operation from the initial assault on June 6 to the crossing of the River Seine on August 19. Operation Neptune referred the beginning of the invasion, covering the assault on the beaches, and ended on June 30. Then there was the lesser known “Operation Fortitude”. Operation Fortitude entailed a massive invasion through the narrowest point in the English Channel by the “First US Army Group” led by General George S. Patton. Operation Fortitude was, needless to say, entirely made-up. A fictitious assault created to mislead the Germans into thinking the invasion would occur at another location. 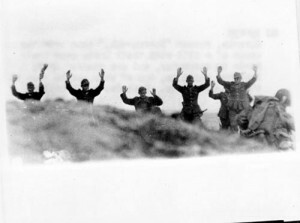 Secrecy was essential as the Germans had 55 divisions at their command in France, and the Allies could only land a maximum of 8 at any one time. Keeping the world’s largest invasion a secret was a feat almost as remarkable as the invasion itself. It required the Allies win complete dominance over UK airspace—Allied air forces suffered tremendous losses in the two months before the invasion in order to make this so. It required the UK to ferret out all German spies within their ranks and region and to force known spies to send misinformation back home. The deception went so far as to set up a fake base for the “First U.S. Army Group” in England opposite the suspected landing site, complete giant rubber tanks, cardboard weapons, a paper mache oil pump, and scripted radio chatter. 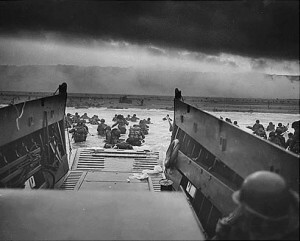 Within five days, over 325,000 troops had landed in Normandy. The exact number of casualties and soldiers killed on D-Day itself are difficult to ascertain due to the large scale and complexity of the operation, and the conditions under which it was fought. 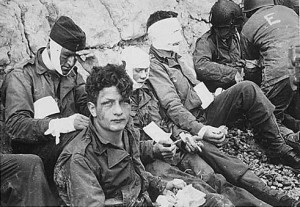 Traditional estimates put the number of Allied casualties at 10,000 with the number of deaths accounting for a quarter of that. More recent estimates have put the number of dead alone at over 4400, a little over half of that figure Americans.